Industrial music magazine Side-Line speaks up: Electro act Frightdoll's career made impossible due to ongoing feud with United Arab Emirates based company. Youtube.com has accepted the counter notice filed against NetManagement's copyright infringement claims and has restored the video. Today publisher NetManagement F.Z.E. had the song Cackling 'round the Cauldron removed from iTunes, as well as the album Assimilation Illusion. A counter notice has already been filed through iTunes, but this process can take a few weeks. Meanwhile, again NetManagement manages to completely sabotage a new Frightdoll music release. I am including below the letter and "Statements" received from NetManagement F.Z.E. this week. As stated in NetMangement's letter, NetManagement again claims not to accept the termination sent towards the publishing agreement. However, even if NetManagement claims not to accept the termination towards the publishing agreement, what right does a publisher have to sabotage an artist's mp3 sales? 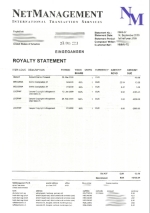 Take a look at the Royalty Statement. 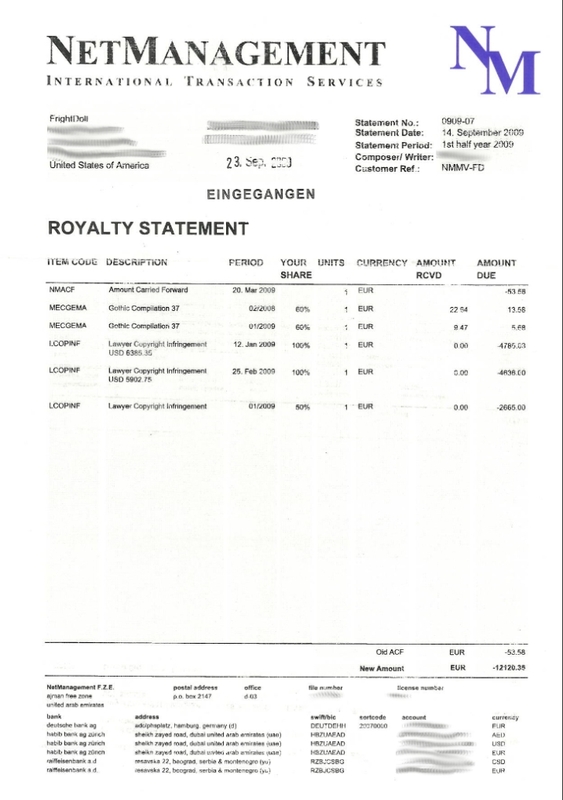 NetManagement claims that 32.01 EUR (22.54 EUR collected from Gothic Compilation royalties for 2008 + 9.47 EUR collected from Gothic Compilation for 2009) were generated in royalties from my music project during the first half of 2009. 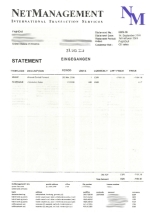 Now, during the same statement period of the first half of 2009, NetManagement claims to have spent 12,087.03 EUR (approximately $18,000) to make copyright infringement claims against my project (claims against my website, my myspace, etc). What kind of company would logically spend almost $18,000 in a 6 month period to make copyright infringement claims against a project that is not even generating $50 in royalties in 6 months and then go on to say that these actions are purely business incentive? But of course, as Mr. Andre Springer of NetManagement states, "NetManagement is neither attempting to sabotage anyone's projects nor attempting to prevent anyone from exercising any of his or her rights." Below, all three pages of Netmanagement's latest letter. Click on the thumbnails for a full view. After reading the September 14th entry, many of you have asked me why the attorneys of the �new record label that I signed with� aren�t helping me to handle the situation. Quantum Release Records is the legal entity that I registered myself as my record label in order to be able to keep on releasing my music. Quantum Release Records is fully owned and operated by myself. NetManagement FZE has filed copyright infringements claims on the official Frightdoll Music Video for the song �Alone in This� released on September 9th, 2009. Counter DMCA notices have been filed with both companies and legal action is pending against NetManagement FZE. NetManagement/NMMV (NetManagement Musikverlag) has also contacted the director of the video, Danny Rendo, accusing him of copyright infringement, even though Mr. Rendo directed the video as a work for hire for Quantum Release Records. This is not the first incident of NetManagement�s deliberate sabotage against Frightdoll�s music project. Throughout the months, NetManagement/NMMV has filed numerous copyright infringement claims on fan made videos through youtube.com. Many of these videos consisted of original footage created by the fans (such as fans recording themselves drawing sketches), but due to NetManagement�s aggressive legal threats to youtube.com, Youtube.com has not restored the fan made videos. On August 10th, iTunes was contacted by NetManagement�s attorney stating that the album Assimilation Illusion was available through their stores without authorization. This claim actually went as far as NetManagement�s attorney claiming to BE �Frightdoll�. On March 16th, 2009 NetManagement targeted Frightdoll�s website host to take down the entire Frightdoll.com website (the website does not even have any songs available for streaming or downloading, it�s just an artist info page: www.frightdoll.com). Amongst all of the claims that NetManagement was making against the website, NetManagement claimed that unauthorized graphics, photographs and artwork were being used throughout the site. NetManagement had absolutely no rights over any graphics, photographs, or artwork which were either created directly by the artist Frightdoll, or for which Quantum Release Records hired graphic designers to create, or for which photographers were hired by Quantum Release Records to take photos of the artist to promote the music project. After filing several counter DMCA notices, the Frightdoll website was restored on April 14th, 2009. Meanwhile, NetManagement completely managed to sabotage the Frightdoll music project and prevented Frightdoll from promoting the release of the album Assimilation Illusion. NetManagement F.Z.E. made claims on songs from Assimilation Illusion (however no claims were made against the songs that were up on myspace from the album Reference Version, as clearly having these songs up on myspace generate sales for the album Reference Version which NetManagement sells and for which the artist Frightdoll is not receiving profits from). In this claim, NetManagement also made copyright infringement claims over photographs of Frightdoll which were taken by a photographer whom Frightdoll paid directly, graphics and artwork created by a graphic designer hired directly by Quantum Release Records, as well as banners and any mention whatsoever throughout the Frightdoll profile of Quantum Release Records or the release of Frightdoll�s second album, Assimilation Illusion. This was done shortly after the release of Assimilation Illusion (AI was released on December 12, 2008). Again, completely sabotaged the promotion for the music project, tried to drown out that the artist had a new album out, prevented the Frightdoll project from generating sales, and caused the artist unneeded stress. After filing several counter DMCA notices and providing www.myspace.com with proof of rightful copyright ownership of the material in question by the artist and Quantum Release Records, on February 18th, 2009 myspace.com honored the counter notices and restored all of the material which had been unfairly removed. In November of 2008, Quantum Release Records hired a company in Germany to help promote Frightdoll and the release of Assimilation Illusion to webzines, online radios, DJs, magazines, clubs, etc. 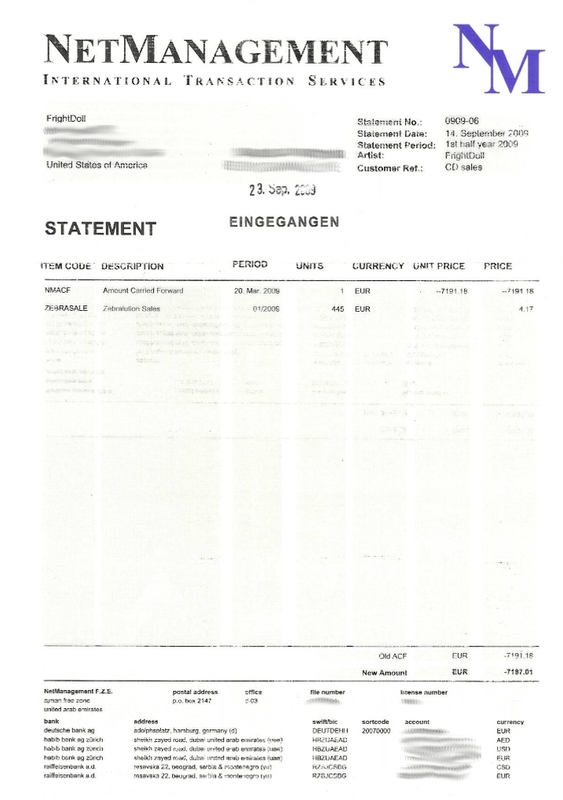 On December 13th, 2008 (one day after the release in the United States of Assimilation Illusion), the owner of the promotion company in Germany received a letter from NetManagement�s attorney with a restraining order regarding the promotion of the Frightdoll music project and latest release. The letter sent by NetManagement�s attorney stated that the promotion company would have legal action taken against them in the amount of 50,000 EUR if they promoted the Frightdoll music project and release of Assimilation Illusion. However, the letter did NOT state that NetManagement was entitled to take from the promotion company the promotional material and CDs that had been sent to the promotion company. The owner of NetMangement attempted to intimidate the promotion company to handing over to NetManagement, without any right, the promotional material and CDs which had been given to the promotion company by Quantum Release Records. 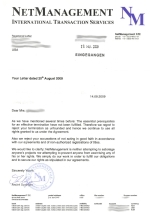 The threats by the owner of NetManagement to show up at the promotion company�s office with the police were so severe and persistent, that the promotion company had to hire their own attorney to put a freeze on the CDs and promotional material so that NetManagement could not forcibly take the material in question. At the same time this was happening in Germany, DSBP (http://www.dsbp.cx), who had agreed to help distribute Assimilation Illusion, also received threats by NetManagent F.Z.E. of having legal action taken against them if they promoted the Frightdoll music project in any way or distributed Assimilation Illusion. NetManagement FZE�s physical offices are located in Germany and the company is operated out of Germany. However, NetManagement FZE �s company registrations are in the United Arab Emirates. This has made it very difficult to put a stop to NetManagement�s continued harassment. In 2007, Frightdoll signed a publishing and licensing agreement with the company NetManagement F.Z.E. Frightdoll�s first album, Reference Version, was published and released by NetManagement F.Z.E. NetManagement used �Frightdoll Records� in order to release this album, even though the artist �Frightdoll� ended up not having any control over NetManagement�s decisions regarding the sale and distribution of the album, as NetManagement simply acted without acquiring approval from the artist before making any decisions. After the release of Reference Version, NetManagement F.Z.E. claimed that the same album which had been directly released by NetManagement FZE did not even count towards the minimum commitment established in the publishing contract of their own company, as the album had not been released by a �MAJOR� record label. After numerous breaches of contract from NetManagement�s part and continued instances of personal harassment, Frightdoll�s attorney in Germany sent termination letters to NetManagement FZE. 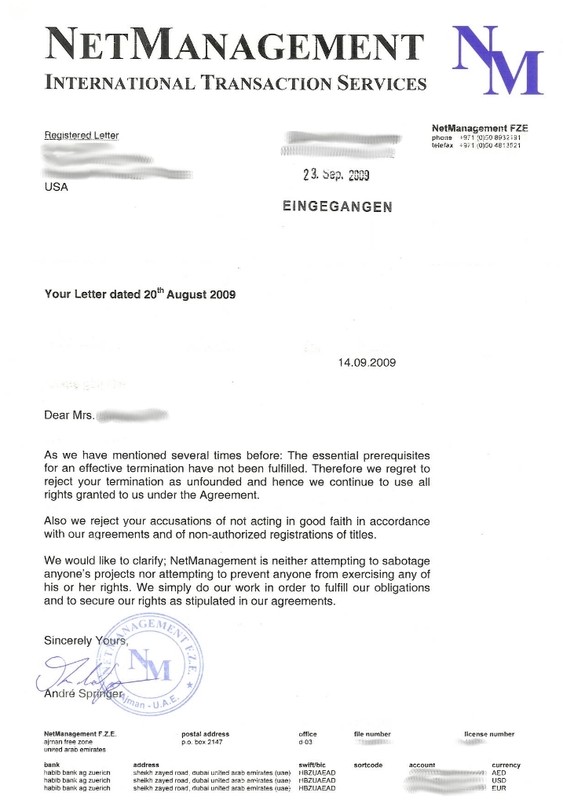 NetManagement not only simply refused to accept the termination letters without even addressing the material breaches of contract, but refused to even accept the legal power of attorney that Frightdoll had given the attorney, even though it is a perfectly legally valid power of attorney according to German law. NetManagement has been informed numerous times by the artist Frightdoll that all further correspondence is to be sent directly to the artist�s attorney. However NetManagement continues to send correspondence directly to the artist�s personal home, which is deliberate harassment. NetManagement has in the past even hired process servers to deliver letters directly to the artist�s home. NetManagement continues to register, without any authorization, all of Frightdoll�s new material through different societies, including ASCAP, GEMA, and the Library of Congress. Because NetManagement�s company registrations are in the United Arab Emirates, it has been nearly impossible thus far to prevent NetManagement from their continued unjustified harassment, without starting a Federal lawsuit (state courts would not even look at a case like this). The costs of initiating a Federal lawsuit are beyond the means of what the artist can personally afford. Music Video for "Alone in This" from the album "Assimilation Illusion" released online today. Directed by Danny Rendo of Broken Wire Media. So how does a Frightdoll spend her �summer� vacation? In a cavern full of stalactites and stalagmites, experiencing absolute darkness. And no, I don�t mean the local goth club! Actually, it was pretty great. For all the years I�ve lived in Florida, I realized that there are plenty of places that I still haven�t explored. I recently found out that we have caverns here, in the city of Marianna. Whereas last year I had the opportunity to experience absolute silence (the experience was life changing), this past weekend, I got to experience absolute darkness. Not the kind of darkness that we �see� when we turn off the lights, but total darkness. It seriously almost made my eyes hurt. This vacation wasn�t all about �darkness�. I also got to see a very adorable little bat in the cave, and super awesome stalactites and stalagmites. The rest of the weekend was spent in St. Augustine (this is the oldest city in America, the first city discovered in the �New World� by Ponce de Le�n) visiting Fort Matanza (very tiny) and the Castillo de San Marcos. I also visited the Fountain of Youth in which I got to try some water that tasted like a whole bunch of sulfur. They said it was full of minerals which are good for you so well, I drank it. What else? Oh, a completely kitsch ghost tour. We were taken around the city and told about the atrocities which occurred there, from old methods of curing �diseases� (like cutting the patient�s wrists to drain out their �bad blood� when they had a fever), to the town�s public executions, and even a tour through the death sentence jail cells. Although really, most of the individuals attending this �tourist attraction� wouldn�t have been able to bear the reality of the history of this place, had it not been for the �comical twist� that the tour played upon it. Many of you have over time, uploaded fan videos to Youtube including songs off of Reference Version. I am aware that most of you who have done this have ended up with either suspended Youtube accounts or have had the videos deleted by Youtube due to "copyright claims" from NetManagement FZE. For all of you who have gone through this, I am truly sorry. I assure you that I have in no way had any part in making any claims against your accounts and I can do nothing but express my most sincere apologies to any of you have had to endure this. For the most part, I'm usually totally happy to see fan videos popping up on Youtube. I know that many of you have taken a lot of time to put these videos together with photos and your own creativity, and that is something that I completely appreciate. As some of you are already aware, NetManagement FZE has also made numerous "copyright infringement claims" against my own profiles and websites. So I'm already entirely familiar with the amount of havoc that NetManagement FZE is causing. I hope that you understand the difficult situation that I am dealing with, and that I sincerely appreciate all of the support that so many of you have given me.